White Chocolate Mudcake – any size you need! Originally given to me by my mother in law, I can’t tell you how much I love this handy recipe! The white chocolate mud cake that results is moist, not too rich and stores well for ages even if you don’t freeze it – though it does freeze very well. Here you’ll find the quantities for almost every kind of cake tin you might need to use, which is just terrific. Finally, the other great thing about this recipe is that it is just a melt and mix cake – no creaming butter and sugar. Even though white chocolate adds to the cost of the cake, the cost of this recipe is still quite reasonable, especially compared to store-bought cakes (and this one is much, much nicer). Today I’m using this versatile recipe for my daughter’s birthday cake – she’s turning 3 tomorrow! Grease and line base and sides of cake tin with baking paper, bringing paper up 5cm above the side of the tin. Combine chopped butter, chopped chocolate, sugar and milk in saucepan. Stir over low heat until chocolate is melted and sugar dissolved. Transfer the mixture to a large bowl and cool for 15 mins. Stir in sifted flours, vanilla and lightly beaten eggs. Pour mixture into prepared tin. Bake for time given on chart. Cover cake with foil half-way through cooking time if over-browning. 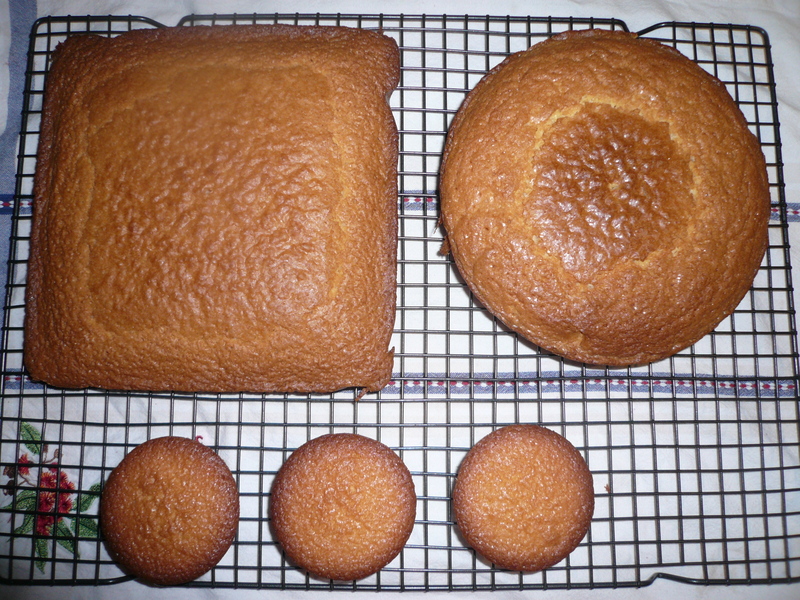 Cake will develop a thick sugary crust during baking. Test with a skewer close to end of cooking time. Cool the cake in the tin. Bring cream to the boil in a small saucepan, pour cream over white chocolate in a small bowl, stirring until chocolate melts. Cover, refrigerate, stirring occasionally about 30 mins or until mixture is spreadable. I’m looking to use this recipe for my daughters birthday cake. It’s so great that you’ve given quantities for various sizes tins. I just wanted to check that when you say vanilla are you talking about vanilla essence? And that the temperature is in Celsius? Lol! Hi Georgina. Yep, either vanilla extract or vanilla essence will work fine in the cake, the degrees are in Celsius and all measurements are metric. Hello, thanks so much for the recipe. I made the 20cm cake today and although it tasted absolutely delicious and the outside lovely and golden, the inside looked raw. I checked with a skewer and it came out clean??!! Should I just have kept it in the oven longer? I know it’s mud cake so should look different to other cakes, but I’m a bit nervous serving it up to people as if I was given it I would think that it wasn’t cooked! Appreciate your advice. Thanks. Thanks for your encouragement. Hard for me to say without being able to see the cake myself. You’re right about the consistency – it’s meant to be firm and moist, without being gooey or wet. Mud cakes, like Brownies, and anything with a large sugar content continue to cook once they come out of the oven, and often once completely cooled, I’m glad I haven’t baked these things for longer. But as long as it isn’t gooey, I would go right ahead and serve it – the eggs will be completely cooked and most people prefer things moist. Hope this helps. Thanks – appreciate your advice.